This model also allows you to adjust the widths (29, 26.5 & 24cm) and the height (23.5, 27.5, 31.5 & 36cm). 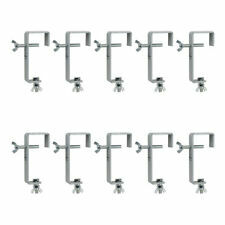 Lamp Leads & Accessories. Stand & Cases. Angled Arms & Adjustable Height/Width. Pro Audio & Lighting. What if I have not received my order?. When will I receive confirmation of my order?. In Ear Monitoring. Air Conditioners. weight load: 20kg. Bags & Cases. Speaker Hardware. Speaker Cables. Key Points. Can I reserve item(s) that I intend to buy later?. How do I find the item number or product code?. Active PA Speakers. Need more information?. What if I have not received my order?. The warranty covers manufacturer faults and does not cover misuse of the item, for example a 'blown out' speaker. When will I receive confirmation of my order?. What if I have not received my order?. San Marino. Czech Republic. Air Conditioners. weight load: 20kg. Bags & Cases. Speaker Hardware. 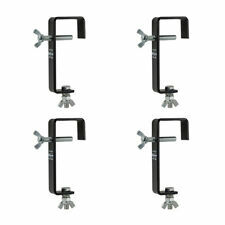 Compact Multi Adjustable Laptop Stand with Fixing Clamps DJ Soundlab. 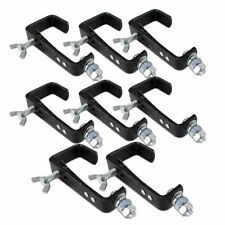 8 x Black 25mm Hook G Clamp. load WLL (4-fold): 20 kg. load BGV C1 (8-fold): 10 kg. load BGV C1 (10-fold): 8 kg. load BGV C1 (12-fold): 7 kg. 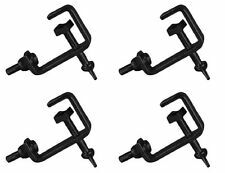 Hook for installing projectors, lighting effects etc. via a truss system. Microphone Boom Stand Mic Stand Light Microphone. Microphone Boom Stand Short Kick Bass Snare Mic Stand Heavy Duty Microphone. Type Lighting Truss. Flight & Rack Cases. 400mm 40cm Flexible Microphone Gooseneck Accessory Black. 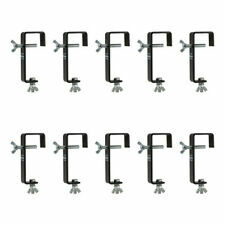 20" to 37" LCD/TV Monitor Bracket | Pole/Bar Mount | 35mm Speaker 60mm Truss. Bright zinc plating to blend with polished truss. Microphone Boom Stand Mic Stand Light Microphone. Microphone Boom Stand Short Kick Bass Snare Mic Stand Heavy Duty Microphone. How do I find the item number or product code?. Weight Load: 25kg. weight load: 25kg. Need more information?. What if I have not received my order?. When will I receive confirmation of my order?. Czech Republic.